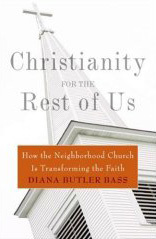 Christianity for the Rest of Us by Diana Butler Bass was published in 2006 by Harper San Francisco. Bass is a well known author, speaker and thinker among mainline protestants. Christianity for the Rest of Us is a result of a three year study that was “designed as an in-depth ethnographic investigation of vital, healthy, viable and growing mainline Protestant congregations through field research across the United States” (Bass, Christianity for the Rest of Us, 295). Within these congregations, Bass sought “to discover whether a common pattern, language, and spiritual logic were taking shape in a variety of congregations in different parts of the country” (Bass, 4). In the first section, Bass addresses the question “What happened to the neighborhood church” (Bass, 13)? She addresses shifts that have taken place in society and within local congregations in the United States over the past 50 years. This background sets the stage for the particularities of renewal within the churches studied. Each of ten “signposts of renewal” among the congregations are addressed with concrete examples from local communities. These signposts of renewal include: hospitality, discernment, healing, contemplation, testimony, diversity, justice, worship, reflection, and beauty. Finally, Bass uses the metaphor of shifting from tourist to pilgrim to address the potential for individual, communal and world transformation. This book is a well written mix of individual examples and big picture topics. There is a concreteness to each of the signposts of renewal as they are all grounded in particular examples from local congregations. Bass does not provide a detailed blueprint for change, but instead paints a vivid picture of what the experience of vitality looks and feels like within a local congregation. Bass writes for a particular audience – liberal protestant congregations – and at times is a bit harsh on those outside of this group. I enjoyed this book and would recommend it to those thinking seriously about renewing the mainline church. Church leaders, pastors, and mainline Christians looking for renewal within the church would enjoy this book. Bass, Diana Butler. Christianity for the Rest of Us. San Francisco: Harper San Francisco, 2006. I just read the blog post on Google Sites. This looks like great stuff. I know that our IT team has SharePoint on the radar screen for an install here at Resurrection, and it looks like there may be some similarity in features here. Any church leaders implementing or thinking about implementing any of the suite of Google Apps in your congregation? This is one technology that I think may be a great help for congregations as the functionality (email, documents, intranet) and price point (free for registered US non-profits) hits a sweet spot. I have been able to be at the last two Leadership Institutes here at Resurrection. In 2007, I taught a session, which was a lot of fun. I want you to know about the opportunity to host Leadership Institute at your Annual Conference. You can download a PDF document with more information here. Are you thinking about coming to Leadership Institute 2008? As pastor in a mainline congregation, I recognize that there are different types of relationships between local congregations, pastors, annual conferences and the denomination. There has been some comments in two previous posts (Granger Community Church and Where is the United Methodist Church going in the next 25 to 30 years?) about this subject and I want to address this issue more fully. In this post, I hope to clarify a few of my thoughts on the subject and get your additions and responses. I will speak out of my context within the United Methodist Church, but I think that these categories may apply to any congregation that is part of a denomination. Name – A local congregation may or may not use part or all of “The United Methodist Church” in their name. Branding – The cross and flame may or may not be incorporated into website, signage, etc at a local church. Financial -A local church may or may not pay their share to support the ministry of the denomination, annual conference and other agencies. This is most often the apportionment responsibilities of the local church. Preaching and Teaching – A Wesleyan understanding of faith may or may not be taught within a particular local congregation. Pride / resent – A local congregation may be proud or resentful of their connection with the denomination. I see this as a spectrum along which any particular congregation may exist. Way of Faith- Local congregations and leaders may place different levels of importance on living one’s faith in a Wesleyan or Methodist way. What am I missing? What would you add to this list? What would you subtract? I will use this post and your comments to more fully respond to some of these issues in future posts. Thanks for your thoughts! Where is the United Methodist Church going in the next 25 to 30 years? This is a question which I received from a member of the congregation earlier this year. This is a great question, which I am not sure that I am equipped to answer fully with all of its implications. I will answer where I hope the United Methodist Church is going in the next 25 to 30 years, which may not be where it actually goes. My hope first of all is that the UMC continues to be faithful to God’s call. I believe that the particular way of understanding faith as United Methodists is a way that will continue to produce fruit in God’s kingdom. Every day when I am at church, I pray for renewal within the United Methodist Church, spiritual revival in the state and for Resurrection to be faithful to her vision, mission and journey. My hope is that the United Methodist Church will continue to rediscover and renew the practices of John Wesley and the early Methodists – meeting in small groups, a fervor for spreading the good news of Jesus Christ, and a flexibility in using whatever means are necessary to make disciples of Jesus Christ and “spread scriptural holiness across the land” (John Wesley).